From Cleats to Caps, Thompson's Has You Covered! Thompson’s Sport Shop, your Savannah Sporting Goods headquarters for the team uniform and sports equipment for Georgia teams. We carry the best brands in team uniforms and sports equipment. Check out our website and visit our supplier’s catalogs. We specialize in the custom sports uniforms GA baseball, football, basketball and soccer teams need, plus we also specialize in letterman jackets and cheerleading uniforms. Thompson’s Sport Shop supplies the Savannah area including Pooler, Blommingdale, Richmond Hill, GA and Hilton Head, SC custom sports uniforms and equipment. 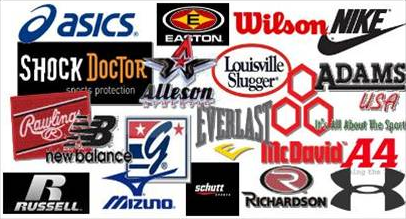 Our manufacturers include A4, Adams USA, All-Star Sports, ASICS America, Badger Sports, Don Alleson, Easton, Everlast, Louisville Slugger, McDavid USA, Mizuno, Mueller Sports Med., New Balance, Nike, Pro Nine, Rawling, Richardson, Schutt Sports, Shock Doctor, The Game, Under Armour, and Wilson. Thompson’s sales representatives cover the States of Georgia, North Florida, Alabama and South Carolina. Our Georgia sales reps ensure that our Atlanta customers can get exactly what they want, at exceptional savings. At Thompson’s Sport Shop we know that our customers have an endless array of other sporting goods suppliers to choose from these days. Excellent quality, professional service, and courteous staff make every client comfortable with their choice in suppliers. Owned by Bennie and Jennell James and managed by Larry Thompson, this Savannah sporting goods company has been supplying Savannah custom baseball and football uniforms for over 40 years. Our team is committed to providing superior knowledge of inventory, a quality product, and competitive pricing. Thompson’s highly experienced staff will tailor a team’s uniforms and equipment to guarantee protection as well as comfort in practice and during the game. Take a moment to peruse the marvelous products Thompson’s Sport Shop carries every day. Call, go online, or come in today and let our Savannah sporting goods team know how they may lend a hand in acquiring the right fit in your sports equipment and team uniform needs.